If you have ever wondered what the difference between commercial-grade carpet and residential carpet is, then look no more. Today’s post from Really Cheap Carpet Cleaning Brisbane is about exactly that. We know carpet inside and out, and we clean it all. Below is the five main differences between the carpet you find in your work office, and the carpet you choose to get laid in your home. Firstly, the way it looks is the main difference. When you choose carpet for your home, the range of piles and colours and styles is almost overwhelming. With commercial carpet, the main priority is functionality and durability while giving a professional look. With colour choices there is a preference for lighter shades in residential spaces, giving the illusion of space and light. In commercial spaces which are quite a bit larger, darker colours are favoured for their stain-hiding ability. Patterns are more frequent in a commercial setting, whereas solid colours are more commonly used in homes. Comfort is the second main difference. In a home setting, you want the carpet to be soft and plush underfoot. This means the fibres will be longer and softer. The underlay will be a cushioning one to assist in reducing sound and increasing comfort. In a commercial building the pile length is likely to be shorter and coarser to increase it’s durability. Which brings us to the third difference. Durability is the third difference. Commercial carpet has a much higher foot traffic than the average residential home. This makes durability the biggest consideration in an office building. The shorter fibres mentioned under comfort also contribute to the longer life span of the carpet. the shorter the fibre, the less there is to get flattened and worn out from people walking over it every day. Cleaning the carpet is the fourth. 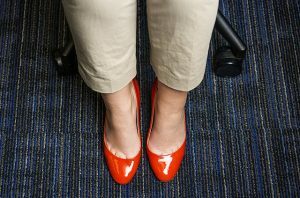 Office carpet will require much more frequent cleaning via vacuuming than the average home. Once again, shorter fibres means less depth for dirt and debris to get in, making vacuuming easier and quicker for cleaners. Depending on the office environment, deep cleaning will also need to be done more frequently, so the carpet has to be able to withstand that as well. Lastly, along with durability, commercial carpet is expected to not only last a long time under harsh conditions, but also look good for just as long. The expectation is that it should last under these conditions for at least 10 years, if not more. Regular cleaning and maintenance from a company like Really Cheap Carpet Cleaning will assist in keeping your carpets clean and in top condition. It doesn’t matter if it’s residential or commercial, we will do everything we can to bring it to life! Why not contact us now to see what we can do? Welcome to the Weekend Get A Rug For a Splash of Colour!